Interactive design constantly proves to create a memorable connection with participants. Creating interaction can come to life in many forms, one of them being kinetic sculpture. A great example of this is an installation titled Breaking the Surface. 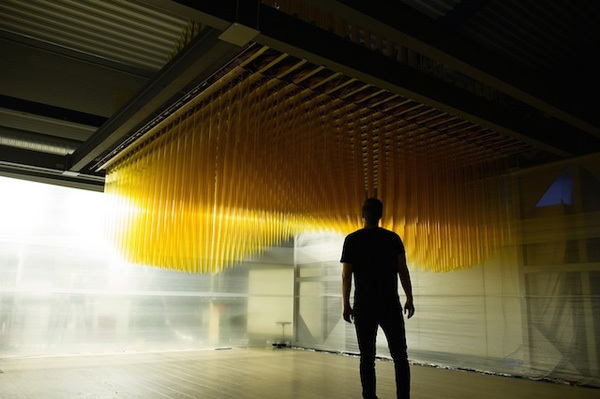 This interactive installation from Scandanavian Design Group, co-created with Ctrl+N, Abida and Intek , extends through the floor of a two-story environment. 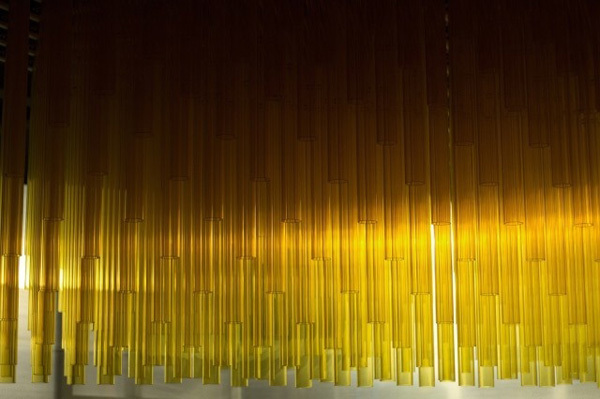 Within this space amber waves of acrylic plastic form a mechanized matrix of movement. It is not simply movement, but the movement around a moving object that is so fascinating. When people approach the sculpture, the rods are retracted into the building’s upper level, dodging the heads of those passing by. At the same time, the sculpture has a tide-like effect that keeps the surrounding tubes moving in a smooth motion. It is customized coding known as openFrameworks that keeps the complex system of sensors, pipes and mechanical parts in synch. The sculpture, designed for Norwegian oil company Lundin Norway, is an abstract representation inspired by how the company’s geologists and geophysicist’s look at the world below sea level through detailed reconstructions of sub-surface landscapes created from seismic imaging and drill samples.